Under the Rover you can understand the different means of transportation. It is familiar to us SUVs, and tractors, and snowmobiles, and even tanks. The Rover can be done by yourself, or rather, to transform an ordinary scooter or motorcycle to a trusted friend who is not afraid of any dirt or off-road. The focus of this vehicle lies in its footwear, that is, crawler links, which are attached to it. The caterpillar is a 4-lane width of 5.5 inches. Cut strips from the conveyor belt and connect the steel U-shaped profiles. Fabricate beams for intermediate support of the belt. Using the stamp, cut out a round sheet steel halves of the wheels disc. Then carved bronze hub. Connect the cut halves of the disk with the 6 bolts. Balance weights ready. Carved shafts front and rear support wheels caterpillar steel rod. Make at each end of the holes for the bearings. Insert them in the bearings. Fabricate the supporting drums the tracks of duralumin workpieces, then secure them with bolts. When fastener insert between the reels rubber stars. 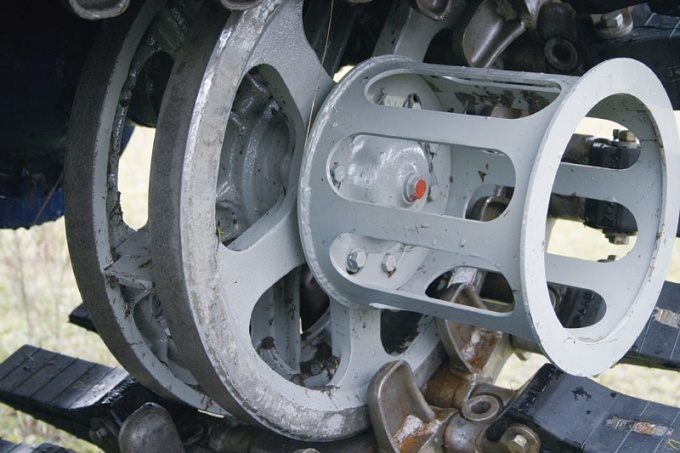 Thus, the caterpillar begins to spin from the chain drive sprocket which is installed in place of the wheel. The drive sprocket is mounted on the rear fork with the spacer. Collect all the details of the tracks in one link. Chassis covers attach to the body bolts. To a vertical tubular arc weld a steel sleeve, through the opening which passes the axle is removed the wheel. The eyelet at the front of this sleeve is designed for attaching a special node, which captures the entire design on the rear fork of the vehicle. Two lug weld under longitudinal pipe and connect the rocker made the tracks. The caterpillar for all-terrain vehicle ready.